Bacon Worshiping Computer Geek, Agent of S.H.I.E.L.D. and collector of comics. Nick’s is a Gyro place. You can tell because it is called “Nick’s #1 Gyros”. Despite this misleading information, Nick’s Reubens far surpass his Gyros. Don’t get me wrong, he makes a good Gyro too, but his Reubens are out of this world. A full 1/2 pound of thinly sliced corned beef, just the right amount of sauerkraut nicely grilled on rye and served with Thousand Island dressing on the side. 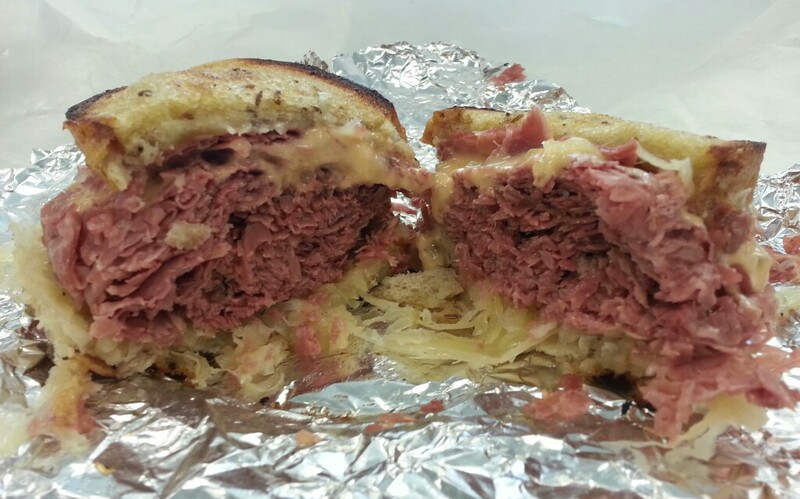 I’ve had a lot of Reubens and Nick’s is one of the best. Recipe: CrockPot Bacon and Cheese Dip Recipe. On our way home from the movie theater my son decided we should stop at the local Denny’s for dinner. He’s a big fan of the Build Your Own Junior Grand Slam because he can replace eggs with a second helping of bacon. I didn’t mind the idea so to Denny’s we went. Just so happens I was wearing the “Born To Eat Bacon” shirt that my son had made for me months before I started this site. It was quite a hit with the staff. Upon walking in the hostess asked if I was looking for bacon. “I always am” I replied. “Me too!” she said, smiling. 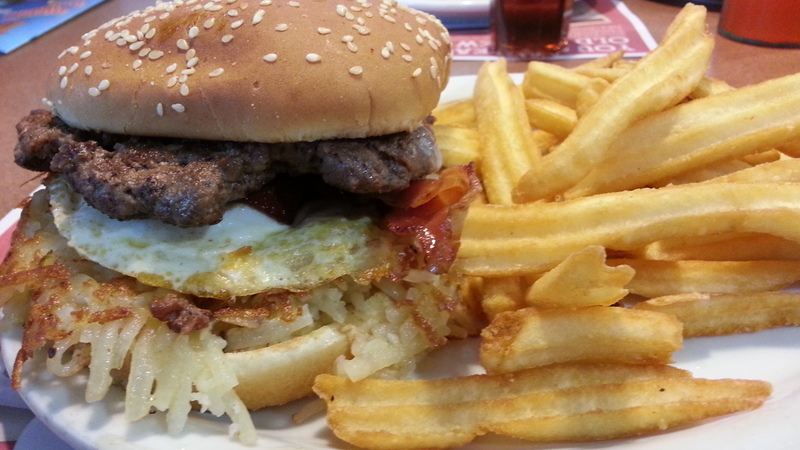 I’ve had various bacon burgers at Denny’s in the past, but tonight I tried the Bacon Slam Burger. Damned glad I did too. This burger takes the “breakfast burger” concept to a whole new level by including crispy hash browns along with bacon and eggs. For a dollar up-charge I got extra bacon to make it extra good. Now this is easily one of the messiest burgers I’ve had lately, with the egg and queso fighting to drip off, but it is well worth it. I loved the combination of flavors and will definitely have it again. Our server, Jessica, was friendly and attentive and the hostess was really nice. I know many look down on Denny’s, and admittedly I once did as well, but our experience was easily on par with an Applebee’s, Max & Erma’s or TGI Fridays. Maybe we are just blessed with an uncharacteristically pleasant Denny’s? 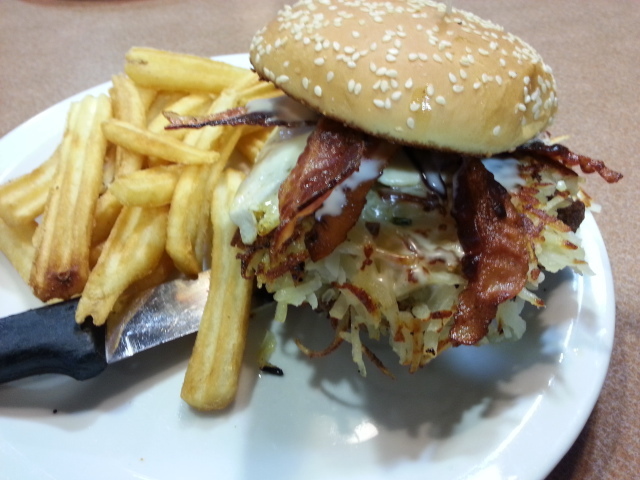 Well put your prejudice aside and stop in for a Bacon Slam Burger. They just might surprise you. 3 Nathan’s hot dogs on Shwebel’s buns with Bertman horseradish sauce and Hienz ketchup, buried in shredded sharp cheddar. Totally delicious and I was so hungry that I had only a single bite remaining when I realized no pictures had been taken. Kayla was forced to get creative this morning as they only had mini flour tortillas instead of the normal huge ones. 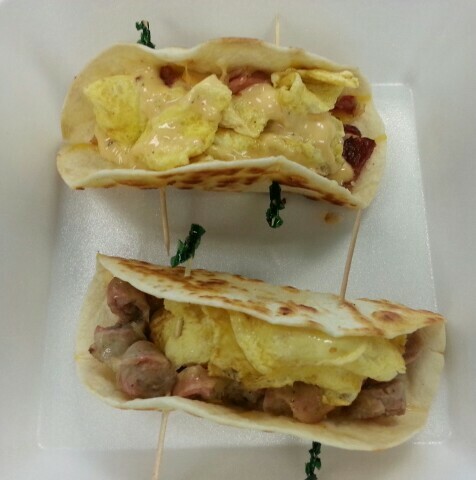 To her credit she took to the challenge like an Iron Breakfast Chef and soon came up with this pair of Southwest Chipotle Breakfast Tacos, one with bacon and the other sausage. Both were quite tasty, but the sausage was slightly better than the bacon. I know, this is the wrong blog to be saying such things, but it was. 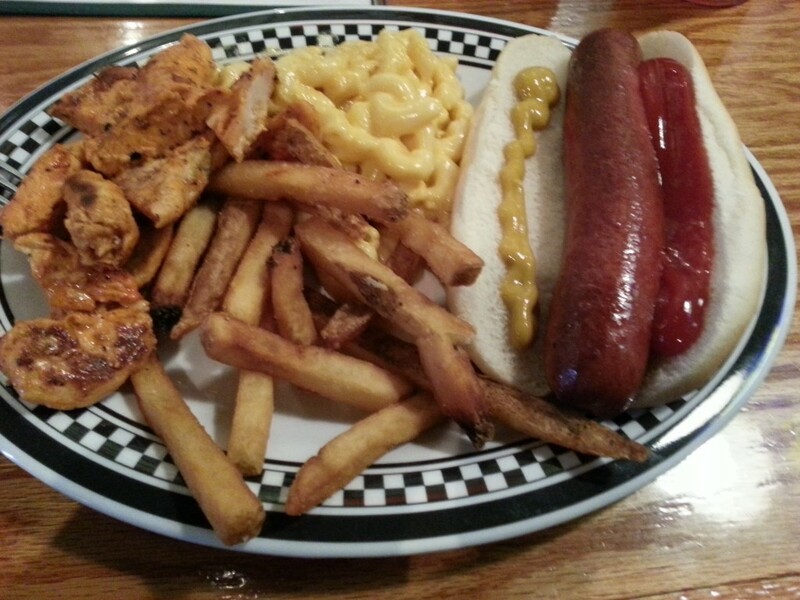 Though not quite a tradition, hitting the buffet at Quaker Steak & Lube on payday seems to be becoming a habit. It helps that payday always falls on a Friday and tasty treats abound on their Friday buffet. This Friday I combined some offerings to create this Double Cheeseburger with nacho cheese and BBQ sauce. 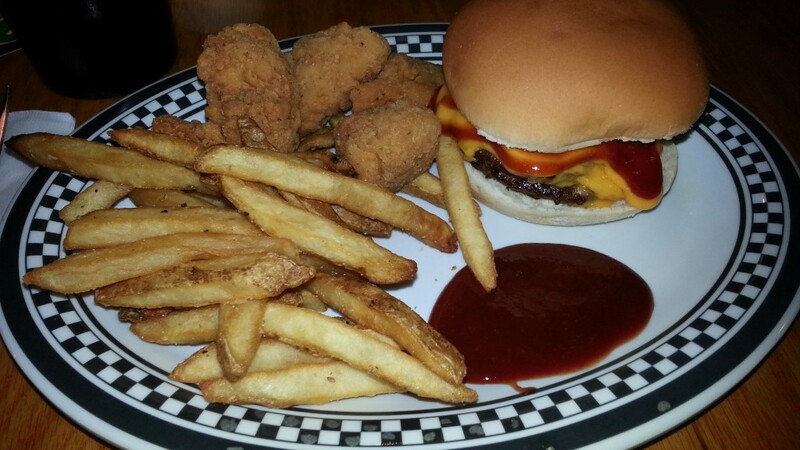 The breaded boneless wings are very good and somehow they manage to have fresh fries on a buffet. They also have high quality all beef wieners and other flavors of wings. I found the wieners are incredible when sliced lengthwise, filled with nacho cheese and topped with banana pepper rings, but also quite good simply topped with ketchup and mustard.